My name is Tom Pilsch. I was assigned as a FAC attached to MACV Team 3 in Hue May 68-Apr69. Although I was not there during the Tet offensive, I have done a lot of research on the battle and the area and taught courses on the war at Georgia Tech in Atlanta. Perhaps some of you have seen my Web sites or Air Ops. I have become interested in the story of Det 5, and the discussions on your message board. I think I can help pin down the location of #3 Dong Da St. (or Ðuong Ðong Ða in Vietnamese). Here is a very detailed 1968 map of Hue from the University of Texas library. Unfortunately there is no index to the red number buildings, but I have compiled a partial list from other sources. The Det 5 location is not on the list ... yet ... but I was able to find Ðuong Ðong Ða: Find the MACV compound on the map (red #8 in the lower right quadrant) along QL 1 before it crosses the river. Then move directly down (south) until you see red numbers 72, 69, 228 and 28 -- that is Ðuong Ðong Ða! Please let me know if any of that looks familiar. If we can get a consensus, I will add the location and links to some of the photos to the index, and you will have added a significant detail to this heroic story. Thank you all for your service and sacrifice, Look forward to hearing from you. Where members of Detachment 5 lived before TET. NOTE: If you see something different, Go to the "Blog Archive" on the right side of the screen then click on "January (2019). The first item is on the "Battle for Hue." after it was Overrun During TET 68. I've just read your story in Vietnam magazine. I've been hearing you guys talk about Det 5 for years so it was good to read the whole story. In hearing some of your stories in person at the reunions, I know that several of you had been assigned to combat units before moving to AFVN, and I know every Marine is a rifleman, but I'm curious as to how much experience they all had in actual combat and whether that made a difference. I don't mean to ask that in a critical way but just thinking how much more difficult it would have been to survive with little experience. Of course, it would have helped if they'd had proper armaments and ammunition. Nancy, perhaps Harry Ettmueller or John Bagwell can provide answers specifically regarding combat experience for the men at Det. 5. We had a discussion here earlier this year about the significant number of broadcasters who transferred to AFVN from other units, some involving combat experience, some not. It is also interesting that quite a number of civilian war correspondents landed their jobs after tours with military units in Vietnam. My own experience was pretty cut and dried: boot camp, less than a year in the radio-tv section at Cherry Point NC, Infantry Training, and direct orders to AFVN. widow of former Det 5 OIC, Captain John Novak, USMC. AFVN'er Harry Ettmueller--a Det 5 veteran and former POW--sent this message about the ceremonies in Washington, DC on April 1st, 2008. It is a copy of an email he sent to Rita Novak, widow of the former Det 5 commander, Captain John Novak, USMC. Captain John [Novak, USMC] and the Det  guidon will now be a permanent display in the Pentagon. We were finally inducted into the Army Public Affairs Hall of Fame last night and John was given credit for the guidon. [And] my personal note to the CSM of Public Affairs was engraved on a metal plaque along with my mention of the Captain's yearly telephone calls to me on my and the Corps birthday. DiBer[nardo] was never mentioned; and there were close to 500 dinner guests for this ceremony. I could never leave out Captain John as he was and still is the CO of AFVN DET#5, HUE. The widows of Anderson, Deering, Young, Niles, Stroub's dad and sister were flown in to DC for this event. This was a sight to behold Rita [Mrs. Novak] and believe me if the Captain were alive today the both of you would have been here with us to complete this long over due recognition. Don Gouin, John Bagwell, myself are in reality the only survivors from TET 1968 Hue [as of 2008] and that little flag is our Battle Flag to be enshrined forever. The new Vietnam Magazine (Feb. 2018) is an anniversary issue commemorating the Tet Offensive. It includes an excerpt from the touted new book "Hue 1968," by Mark Bowden; US Army historian tells the story of an NVA unit's efforts to free VC prisoners during Tet; the political backstory; two Vietnam-era aircraft are featured; a review of a book that tackles the myths of the offensive; and of course, the full story on what happened at our Detachment 5 in Hue. Recommended to all, especially those who were there in Feb. '68. Usually your local book store will have, or can get a copy if you don't already subscribe. Barnes and Noble is a good place to start. It is now hitting mailboxes. ​​​​Short Video of SFC Ettmueller talking about the Hue Detachment. As 1967 came to an end Detachment 5 of the American Forces Vietnam Network began settling in and broadcasting TV in the area of Hue, South Vietnam. The new commander, Marine 1LT James V. "Jim" DiBernardo, USA, had just been welcomed by the NCO-In-Charge, SFC John T. Anderson, USA, and Army engineers SFC Donat Gouin, SFC and SP5 Harry K, Ettmueller. The station's audience included the 1st Cav. Division, the 101st Airborne Division, elements of I Corps, and a large contingent of Marines. Hue, the ancient Imperial capital of Vietnam, was located over 50 miles from the DMZ and considered relatively safe from enemy attack. In January 1968, the station began transitioning to a full Class A operation by adding radio broadcasting. Four men arrived to begin the radio mission: Marine SSgt. John A. Deering to serve as program director, Marine Sgt. Thomas F. "Tom" Young attached as a broadcaster, and Army broadcasters SP5 Steve Stroub, USA, and SP4 John F. Bagwell, USA, (attached from 1st Cav. Public Affairs). They would never spin records or play command information at the AFVN station. In the early morning of January 31st, 1968, Communist forces in South Vietnam launched what came to be known as the Tet Offensive, a series of nationwide attacks on urban areas seeking to foment a general uprising against the Republic of Vietnam government. That day, a division-sized force of North Vietnamese Army troops and Viet Cong guerrillas moved on Hue. The Hue attack was the strongest and best coordinated of the North Vietnamese assaults during the Tet Offensive, and only attack on a large city that resulted in any measurable success. 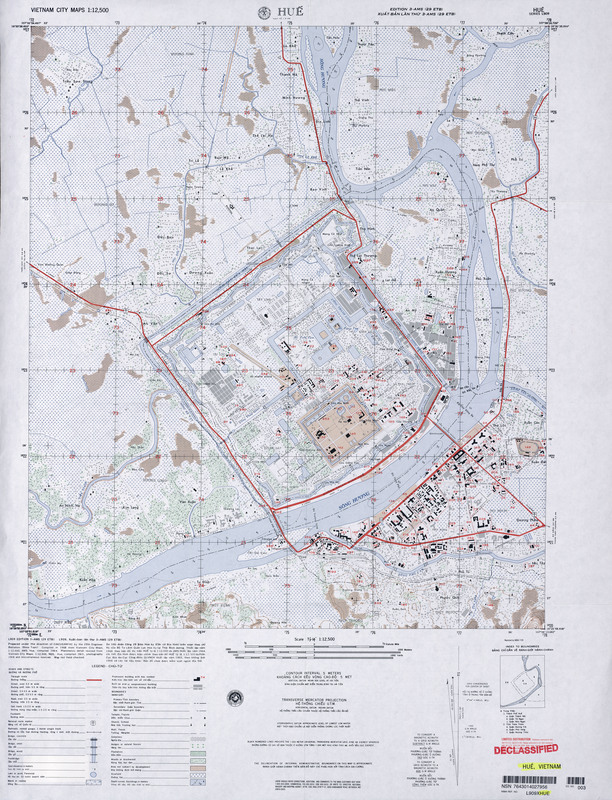 Communist forces held most of Hue's center, what is known as the "Old City," and were seeking to expand their perimeter into the rest of the city against stubborn resistance by RVN forces. They soon faced a strong counter-attack by elements of the 1st and 5th Marine Regiments, later joined by the Army's 7th and 12th Cav. Regiments. When the men of Det 5 began taking mortar rounds and sniper fire on January 31st, they ceased all broadcast operations and took cover in the house they used as living quarters. They fought bravely for their station, holding off North Vietnamese attacks for five days until a full scale assault began on the night of February 4th. Sgt. Young was killed by a hail of bullets amid heavy bursts of small arms and died. SP5 Ettmueller recalls their last conversation being about religion. Young's widow would say that all he ever wanted to do was work in radio and television, and he planned to apply to the University of Missouri Journalism School after his tour. By the morning of February 5th they had used all of their ammunition, eventually running out of food and water as well. Several men worked to make the station unusable to the North Vietnamese. After a series of enemy rocket-propelled grenades set fire to their house, they were forced to flee through a nearby rice paddy towards the MACV compound one mile away. They would not make it to their destination. The men had been assisted by NBC International engineer, Mr. Courtney Niles, 37, a decorated 10-year Army vet who was an enginer who worked for NBC, shared quarters with them, and helped defend the station with the rifle of an Airman on R&R leave. Niles fought with all the bravery of a Soldier and helped save lives by killing several NVA. While escaping the house, he was hit by small arms fire and killed instantly. SP4 John Bagwell managed to evade capture and was given sanctuary by local Catholic priests, at great risk to their own safety. Six others were taken captive; one of them, SP5 Stroub, 20, was summarily executed while being led away, gunned down in the street in front of his comrades. He had fought with absolute valor throughout the firefight and was weakened by an open fracture wound and shrapnel wounds. The five remaining members of Det 5 were each wounded and didn't know if they would survive the day. Drawing on unknown stores of personal strength, they survived February 5th and every subsequent day for the next five years as prisoners of war in North Vietnam, suffering unspeakable torture and depredations at the hands of their captors. They were finally released on March 3rd, 1973. The men of Det 5 AFVN Hue established an unparalleled legacy and fought desperately to defend their broadcast station and their brothers-in- arms. Through the entire ordeal, Harry Ettmueller carried a detachment flag hidden on his person and presented the tattered flag and his prison sandals to the Army Chief of Public Affairs to be displayed in the Pentagon. Thanks, Melody for asking about these guys and giving us a chance to tell their heroic story one more time. And, thanks to Wally and Denny for filling in some of the spaces on the unique life of our friend and colleague, John Anderson. are perhaps more factual (after all, he lived through it), I don't really feel free to change the above. plus his messages of March 2017 and March 2018 in his Photos and Stories page..